Our dogs look so cute and really liked Chris! I love that you come to us and my boys are right outside no long wait for pick up and no cages. I will be using this groomer from now on! Highly recommend! Price was reasonable and service was priceless thank you! I recently moved to Rockland and having Chris groom Candy is wonderful.She took to her right away and was not fearful. I will be using Chris from now on. She is a very experienced groomer and Candy finally looks like a Brussels-Griffon should. She is the first groomer to know what the breed should look like when groomed. I would recommend her to anyone with a pet that is loved and when you want that member of your family to have a fine grooming experience with someone who loves pets. Chris is a loving person and fantastic groomer who takes her time with grooming your dog and makes it such a positive experience! Our little Havanese, Ruby, finally looks beautiful with her expert cut from Chris. And Chris even finds the time to make homemade, healthy treats or knit soft little collars for each dog after his/her grooming. Chris is one of the kindest people you will ever meet with professionalism and dedication overflowing. She should be very proud of her company and all of the hard work that she puts into it! Your dog will love her! on February 6, 2013 at 5:06 am | Reply Chris R.
Having Christine as our groomer has been a God Send! My dogs had been traumatized at their last groomer and I always worried and stressed about taking my two babies- malteses to be groomed in a public place. They were afraid of the larger dogs and I worried they’d be hurt or get sick. It was soooo difficult for me to get them both there, getting them in and out of the car, and never knowing when they would be done. Fortunately, I found Chris. She has been nothing short of wonderful! She is kind and gentle, and my girls just love her…She does a beautiful job on their silky hair, and her magic organic products assure that they never have sensitivities or any tangles! It is so nice to be home doing other things I have to do, while the doggies are being groomed. And they always seem happy to see her which tells me that they are happy and relaxed also. This thoroughly enjoyable experience is topped off by Chris’ special touch. She brings the most wonderful organic, homemade treats. I am so thankful to Chris for getting us through a difficult time. I do not know what we would do without her. A really good friend of mine recommended Chris and her mobile grooming to me for our little Yorkie, Angel, who did not like being groomed in stores with careless groomers and continuously barking dogs. Chris is warm, friendly, and so naturally kind that Angel runs to greet her every time she comes to our home. It’s so obvious that Chris loves what she’s doing. In addition to greeting us with her lovely smile, treating Angel like a princess, keeping her mobile spotlessly clean, and doing a fabulous grooming job, at the end of each session, Chris gives Angel her wonderful natural homemade doggie treats which Angel LOVES. We all enjoy it when Chris is at our home. Thank you Chris for making buddy and cocos experience such a warm and calm one. I have never met a groomer who really loves and cares about each and every pet she sees. My dogs have never looked better they love her and especially love her goodie bags. My two pugs, Bosco and Jada look forward to their monthly “spa day”. Chris is both patient and caring and addresses my needs. When her truck pulls up every month, I know my dogs are in good hands. Thank you! My girls are in love! Gertie and Hazel Mae are two year old Labradoodles who always need special attention for their grooming. Christine does a great job! She is patient and caring and makes it clear that she loves them. I think they actually believe that they are her favorites! I have been using Chris for over a year now and could not be happier and more satisfied. We went through a couple of mobile groomers before we met Chris and our Dakota is very happy now. Chris really shows she cares about your dog, she is patient, caring and takes the time to greet Dakota when she arrives which makes Dakota feel very special. Dakota looks forward to seeing Chris and she always looks beautiful after her bath! We are so grateful to have found such a wonderful goomer. Chris was recommended to my mom and I by some friends for our new dog Stella and it could not have been a better fit for us. Stella immediately took to her, and was sad when her grooming was over. Chris was very helpful, giving us tips about what products to use and which to stay away from to help with Stella’s allergies. Chris is extremely dedicated and passionate about what she does. Thank you! Chris is a loving dog groomer. My little Bella loves her and that is so important to me. I can trust Chris with Bella and know that she’s being very well cared for. Chris loves animals and takes the time to get to know your dog and to establish a relationship with each and every one of them that steps into her van. Each animal has it’s own personality and Chris enjoys getting to know them. She usually has homemade treats that come right out of her kitchen at maybe 4 or 4:30 AM to give to her furry friends. I can only say that Bella’s experience with Chris has been nothing but delightful and positive and, of course, Bella smells and looks fabulous. Thank you again Chris, your the best! I was lucky to find my Wylie at the Hi-Tor Animal Care Center. Wylie is a Brussels Griffon Terrier mix who was in serious need of some TLC in the grooming department! I was lucky again to meet Melinda (above) at the Valley Cottage Animal Hospital with her beautiful (and fluffy) Husky. And after some conversation, I was lucky a third time when Melinda told me about Chris and Good Life Grooming! My Wylie had his little spa day this past Saturday. After his grooming I wasn’t sure if he wanted to stay with me or go home with Chris! He looked and smelled beautiful — and Chris let him “help himself” to some homemade cookies! In the short time they spent together you could see and feel the love and trust between Wylie and Chris. She made his first grooming experience wonderful — he was so excited and playful afterward — just his way of saying “Thank you for taking such good care of me!” I wouldn’t think of taking Wylie to another groomer. Thank you, Chris! Chris got to know my dog first so she was calm ,she was happy and had a great experience she gave her a beautiful cut a homemade treat and a toy that was so nice and her prices are great . Chris has been grooming Vodka for at least two and a half years and I can’t say enough good things about her ! I would not trust anybody else for taking care of Vodka !!! In addition I have to add that Vodka is completely blind and deaf so it is extremely difficult to groom her ! But Chris is so patient and does wonders !!! Thanks again so much Chris !!! Finding Chris nearly two years ago was like finding a rare diamond for us. With two Coton de Tulear’s both on the Senior side of life, it was time to bring down the anxiety level for them as well as myself. Chris was exactly what we had hoped for… kind, caring, comforting and most of all sensitive to both our pups issues and mine as well. Can honestly say she treats them both as if they were her own and cares deeply about their well being, even contacting me daily for updates when we were suffering through a traumatic experience with one. The bonus, is that she is excellent when it comes to grooming them both. They look like they just walked out of “Dog Fancy” after each visit…bows and all! Simply put Chris is a gift that keeps on giving….her delicious treats and beautifully hand sewn goods, just the icing on the cake! She feels like a member of our family… Love her!!! I have two dogs, neither of them particularly good in the car–the one yelps frantically (he was abandoned outside of a shelter), the other shakes and whines and barks at other vehicles (she’s a rescue, too, so who knows what her initial experiences with car travel were). Traveling with the two of them is beyond awful. Thank God for Chris and her grooming van. She has taken a lot of the stress out of grooming day for me. As for the dogs–they just want the cookies! Thank you, Chris! on March 30, 2015 at 1:45 am | Reply Pam O.
Cris is a wonderful groomer. She understands our concerns and decreases our anxiety and our miniature Schnauzer’s by being kind and gentle. She puts our dog first and foremost, you would think he is her only client. She takes her time and never rushes. She is accommodating and gives recommendations for his coat or ears. It is evident that Cris loves what she does because it comes across in how she talks to you the owner and how she treats the dog. We trust her fully with Captain and believe me we are not easy to please. Try her you will never use anyone else’s! Chris is a fantastic groomer! She really cares for my dogs and they look forward to seeing her. She does everything she can to make me and my dogs happy. Highly recommend her for your dogs. Chris has been taking care of our dog Nixon for the last couple of years and she is the best. Nixon is our dog from Guiding Eyes for the Blind, and he is a service dog for son. Chris is so friendly and helpful. She does great work and the kids love the van! Rocco is an Australian Shepherd and loves Chris! She’s been grooming him for the last 2 years. She is patient and loving with him. His cuts always look great and he smells wonderful. It’s a great convience that she comes to us!!! Did I mention he loves the treats she bakes😃! She truly loves her job and it shows. I highly recommend her. It’s been a great experience. Thank you Chris. 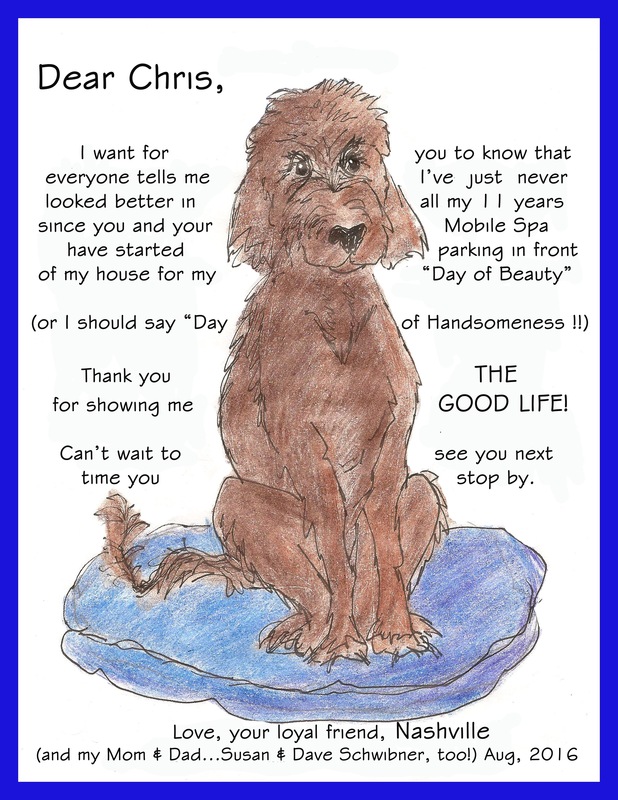 A happy client, I write on behalf of grateful Tucker and Sophie, two Havanese fans of Chris, as well as to sing her praises. She is an expert at all aspects of her profession: she is tirelessly patient and understanding, knowledgeable and problem-solving with tricky rescue dog issues, as well as amused by spoiled doggie silliness; she is thorough and experienced and her treats are amazing. A great groomer, she makes our dogs look and feel wonderful and I am thrilled she is in our lives! Chris has been grooming my Pomeranian, Harvey for a little over a year now. Harvey can be very shy and cautious around strangers, but Chris has had no problem handling him. She does an amazing job, and Harvey always looks great when she’s done with him! We’re so pleased with Chris, and her never-ending patience that we booked all of our appointments for the whole year. We absolutely love Chris. Having her come to our home is so convenient for us and anxiety free for our dog, Charlie. Charlie always looks fabulous after Chis grooms him and he loves her treats. We couldn’t be happier with The Good Life! Chris has been grooming my boarder collie mix for several years. Karma is always so soft and smells amazing after she washes and grooms her. Chris goes the extra mile especailly in the summer when Karma has allergies she gives her a special oatmeal treatment to calm her skin. Chris is very friendly and always has great advice and Karma loves her homemade cookies. I would recommend her to everyone. Chris has been grooming our Dakota for several years now and we could not be happier. We went through a few mobile groomers before we found Chris. After our first meeting with Chris we knew our search was over. We found a groomer that not only does a great job but cares! Chris goes above and beyond and has always been there for me if I have questions or concerns. Mobile grooming is the way to go and being in the pet service business myself I recommend Chris to all of my clients. She’s the best!! Chris, I wish I had found you sooner! Thank you for making our Sophie finally look like a true golden retriever. She looks like a show dog! Her cut is soft and feathery just like a golden should be. I was amazed at how my 3 dogs loved you at first site. I could tell they were all very comfortable immediately. Sophie was looking out the window for you when you left. I have used many groomers in the past and have never been truly satisfied. I enjoyed meeting you and welcomed all the helpful info you gave me. I look forward to a long relationship and I am so happy now that my 3 dogs can enjoy getting groomed and finally look beautiful as they should.